To retrieve the generated alarms, we’ll subscribe to all the events of the IrresponsibleGamblingAlarms stream. When we receive an alarm, we handle it by publishing it on a bus. After processing, we store the position of the last processed event in a checkpoint stream. These checkpoints allow us to continue from the last processed event in the event the projection is restarted or the connection to Event Store is dropped. In this example, we store a checkpoint every time an event is processed; however, if we need to reduce the load on Event Store, we can instead store checkpoints every, say, 1000 events. In order to handle the generated alarm in this example, we will publish the generated alarms to a bus. This could be NServiceBus, some internal bus, or any other kind of bus we prefer. The advantage of this is that we can have multiple handlers for the same event. When the projection starts, it reads the last position from the checkpoint stream, which is passed as a starting point to SubscribeToStreamFrom. If no checkpoint is found, null is passed instead, indicating that the subscription should be read from the start. 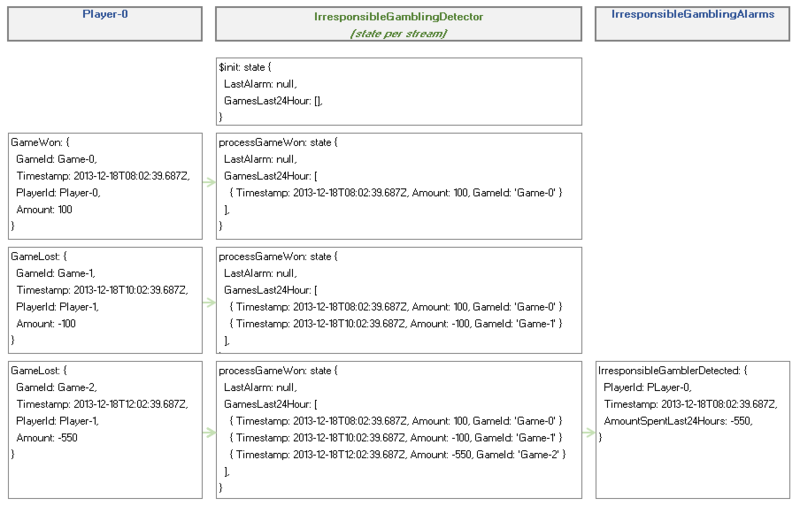 When an event is received, it is serialized to a typed irresponsiblegamblerdetected event and published on a (fake) bus. The position of the last handled event is then stored to the checkpoint stream. The first time a position is stored, the checkpoint stream’s metadata is set to $maxCount: 1. This indicates that we only need one event in the stream (i.e. the last one) and that the other events are safe to remove when the database is scavenged. What if the projection crashes? On the rare occasion our projection crashes after publishing to the bus but before storing a checkpoint, some events will end up published to the bus twice. Therefore, we can only guarantee that events are published at least once, and all our handlers should be idempotent or otherwise ready to handle the same events twice. Because we will have only one projection writing to the CheckpointStream, and from a single thread at that, we can safely ignore concurrency checks when we write the projection using ExpectedVersion.Any. If the TCP connection drops, all we need to do to reconnect is call the Connect() method again. The projection will wait until the connection is reestablished, and then it will continue processing events as usual. This, of course, assumes that we’ve specified the KeepReconnecting connection setting when creating our Event Store connection. Otherwise, we won’t be able to reconnect at all if the connection drops. Imagine a world where online gambling sites were nice enough to notify you when you’re gambling irresponsibly: if you’d spend too much money, they’d take notice and send you an alert via email or text message. Of course, online gambling sites bank on people being just so frivolous with their money, but there’s nothing stopping us from dreaming – or from implementing such a system as our next example. First off, we’ll assume we have a Game aggregate which raises a GameOver that contains a list of the players that participated in the game and the amounts they lost or won. Our irresponsible gambler alarm system needs three projections. The first projection will distribute the GameOver events to GameWon and GameLost events emitted to all participating players. The second projection is a temporal projection that will generate alarms based on the results of all games played in the last 24 hours. The last projection, implemented in C#, will send emails and text messages to any players who lost more than 500€ in the last 24 hours, our eponymous irresponsible gamblers. To process these alarms, we will publish all alarms generated in the second projection on a bus in C#. This projection will calculate the daily average consumption per device. We take our Device streams as input and store an intermediate calculation in the state for each one. This calculation contains the total sum of measurements for the current day. The projection’s result is a new stream for each device which contains a new calculated average for each day. The $init method initializes the state. Each subsequent MeasurementRead event will invoke the calculate method, which will update the state with the total number of measurements, the sum of the measurements, and the timestamp of the last measurement. When we determine from the timestamp that a full day has passed, we emit an event which contains the date, the sum, and the calculated average, obtained by dividing the sum of the measurements by the number of measurements. Again we use the fromCategory(“Device”) definition to tell the engine that this projection’s events come from all streams in the Device category. Streams are categorized based on the stream name before the final dash by default: for example, Device-0 and Device-1 are both in the Device category. To enable categories, the $stream_by_category and $by_category system projections should be enabled. We delegate $init and MeasurementRead event handling to the calculator module, and we’re done. 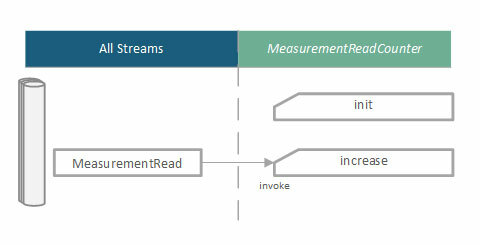 The implementation of the ReadStreamEventsBackward method is explained in the Client API post. This a fairly naive implementation. First of all, the calculation doesn’t handle processing the same event twice properly: it will just add the value to the total twice, throwing off the average. It also expects events in some semblance of chronological order: if it receives an event whose timestamp indicates that a day has passed before it’s actually processed all the events for the day, then the emitted average event will be erroneous. Finally, it will fail to calculate the average entirely if a device stops sending messages during the day. To fix this, we’ll need to implement some kind of timeout mechanism. I’ll cover how to fix these issues in a future post. This example is a variation on the default indexing projection described on the Event Store blog. Another example of partition projections can be found on Rob Aston’s blog. An indexing projection partitions events from multiple streams by linking said events to new streams to based on common properties. These new streams can be used as input for another projection or to retrieve the events from the store in a single read operation. In this example, all MeasurementRead events from all streams in the Device category are partitioned based on their DeviceType. The difference between this example and a basic indexing projection is that the DeviceType property used for the partitioning is not available in every event: it is only available in the first DeviceConfigured event that happens before the MeasurementRead events. So in order to create the index, we store the DeviceType in the projection’s state (per aggregate stream) when the projection handles the DeviceConfigured event. 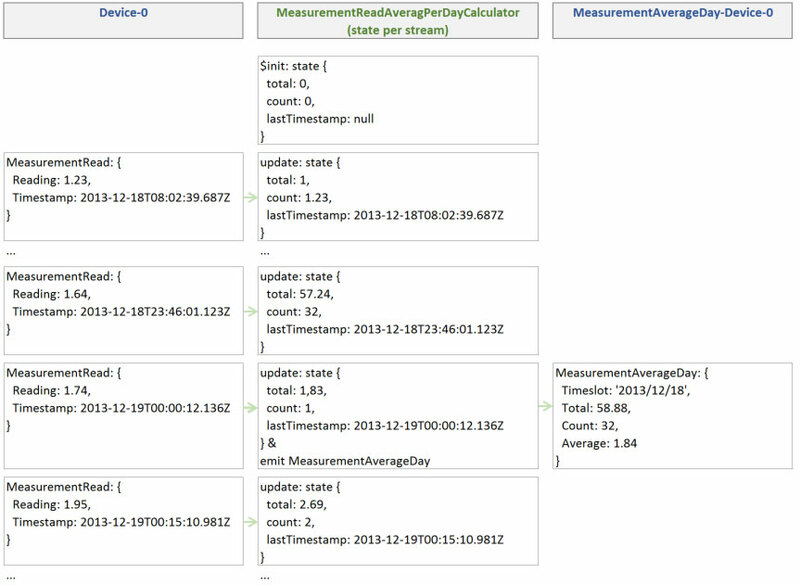 This allows the projection to link each subsequent MeasurementRead event to the corresponding DeviceType-* stream. The projection contains two methods: storeDeviceType, which stores the DeviceType in the state, and linkToDeviceType, which links the subsequent events to the DeviceType-* stream. This module accepts an $eventServices argument in its constructor which is used to pass in a mock object when the module is tested. This mock object is used to verify whether the linkTo method is called with the correct argument. When no $eventServices are passed in, the default Event Store linkTo implementation is used. The fromCategory(“Device”) definition tells the engine that this projection’s events come from all streams in the Device category. Streams are categorized based on the stream name before the final dash by default: for example, Device-0 and Device-1 are both in the Device category. To enable categories, the $stream_by_category and $by_category system projections should be enabled. The first scenario tests how the DeviceType is stored and verifies that the state is updated correctly. The other scenarios test how the MeasurementRead events are linked, validating the cases where the DeviceType is not set and the resulting state after a call to the linkTo method of the $projectionServices mock object. In most cases, the output of an indexing projection will be used as the input for another projection. Combining projections in this fashion provides us with a powerful way to process events. Future examples will show you how this works in practice. Our first Event Store Projections example simply counts the number of events of a specific type. Pretty mundane, I know, but it’s a good place to start. In this example, the projection will take all MeasurementRead events from all streams and increase a counter in its global state for each one. The end result is a global state containing the number of MeasurementRead events. The init method initializes the state for the first time by setting the count property to 0. The increase method increases the count property by 1 when called. The fromAll definition tells the engine that the projection’s events come from all streams. Inside, we delegate $init and MeasurementRead to our counter module implementation. The $init field defines the method that initializes the projection’s state, and the MeasurementRead field defines that all MeasurementRead events are to be handled by the counter.increase method. producesResults is set to true so that the projection’s state is stored in a stream. This allows us to subscribe to projection state updates without polling and use the output of the projection as input for other projections, as I’ll demonstrate later. In the future, we can replace this with the outputState method. To read the value of the projection, we use the getState method of the ProjectionsManager class. These examples are based on the latest main branch version available at the time of writing (RC3.0). Since you have to run the Client API against the same version of Event Store, I’ve included the binaries in the github repository. This means you can check out the examples and run them without worrying about version compatibility or building Event Store yourself. These methods use JSON.NET for JSON serialization. Now that we’ve created a connection and know how to serialize and deserialize events, we can append an event to a stream. We don’t have to create the stream first in this case: if we try to append an event to a stream that doesn’t exist, the stream is automatically created for us. Note that concurrency control in Event Store is handled through versioning. In this example, we skip concurrency control by passing ExpectedVersion.Any when an event is appended to a stream. We can manage projections using the ProjectionsManager class of the Client API. This class allows us to retrieve information about projections as well as enable, create, and update them. In the example, we’re using the ConsoleLogger provided by the Client API. You can replace it with your own logger if necessary. We can store the state of an event in a stream. This allows us to subscribe to the stream and retrieve updates when its state changes. If there’s only one state stored for all projected streams, the stream with the state is named “$projections-ProjectionName-result”, where ProjectionName is the name of the stream. Event Store is an open-source functional database that stores data as a series of immutable events. The concept isn’t new: logs have been used to store data in this exact fashion for decades, but it’s still garnered much attention from the DDD community in the past few years, especially from people implementing CQRS+ES. Event Store Projections allow us to process events, filter events, and even produce new events, features we can leverage for event processing in systems based on Event-Driven Architecture. Be sure to read the README file first.